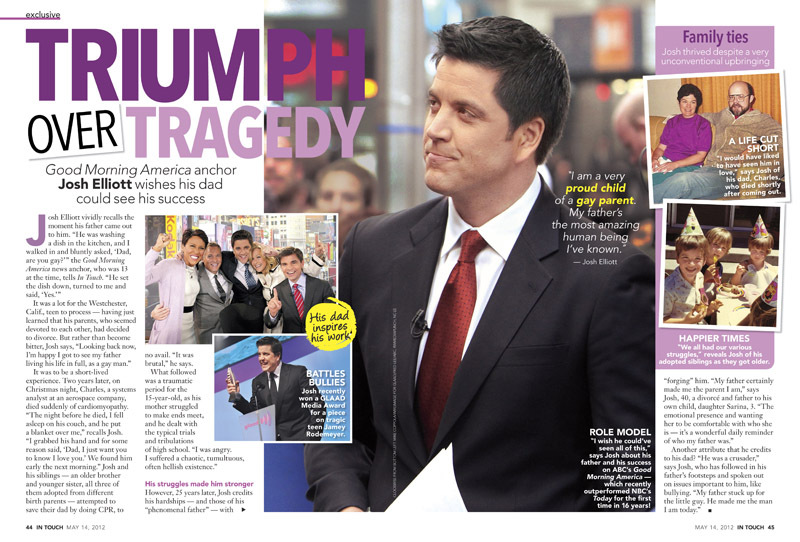 Good Morning America news anchor Josh Elliott shares a harrowing story about his gay dad in the May 14 issue of In Touch Weekly. Just two short years after coming out to his son, Elliott’s father died suddenly of cardiomyopathy. “Looking back now, I’m happy I got to see my father living his life in full, as a gay man,” Elliott tells In Touch. Elliott recently took home the GLAAD Media Award in the Outstanding TV Journalism Segment category for his work on ABC World News’ ‘Battle Against Bullying.’ In Touch Weekly was on hand for the event and his moving acceptance speech prompted coverage in the magazine! Watch his acceptance speech below. This is the latest in a pattern of positive stories from In Touch about LGBT people and allies like Josh. The magazine recently spoke about the decision of the Miss Universe Organization to include transgender contestants and profiled trans actress Jamie Clayton. They also covered Donald Trump, Jr.'s support for marriage for gay and lesbian couples. When it comes to LGBT stories in national entertainment magazines, In Touch Weekly continues to raise the bar.